Pit Pal engine slings make engine changing less back breaking. Simply hook it to your engine puller and attach the four straps to your engine using your header studs or exhaust bolt holes and pull. (NARRATOR)>> TODAY ON ENGINE POWER OUR JET BOAT GETS A MAJOR HORSEPOWER BOOST WITH A BLUE PRINT BIG BLOCK. 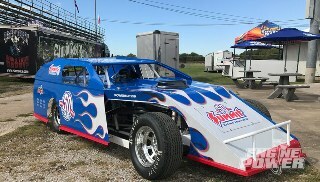 PLUS WE HELPED BUILD JEFF WHITTAKER'S COYOTE POWERED LX RACER. NOW HE'S TAKING IT TO THE NEXT LEVEL, AND A MIGHTY MOPAR WILL GET EVEN MORE POWER. (PAT)>> TODAY ON ENGINE POWER OUR 1974 GLENCOE JET BOAT GETS TO MEET ITS NEW BIG BLOCK BULLET FOR THE FIRST TIME, AND IT'S DEFINITELY GONNA BE A LOVEHATE RELATIONSHIP. OUR NEW 540 MAKES 680 HORSEPOWER AND 669 POUND FEET OF TORQUE. THE JACUZZI JET DRIVE IN THE BOAT HAS HAD SOME UPGRADES, BUT WILL ALMOST 700 HORSEPOWER BE TOO MUCH FOR IT? WELL WE'RE JUST GONNA HAVE TO FIND OUT. (MIKE)>> WE PURCHASED THIS BOAT FROM A LOCAL GEARHEAD WHO HATED TO SEE IT GO. 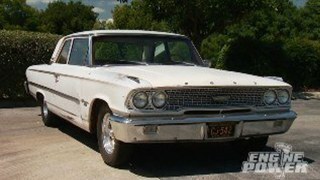 IT WAS POWERED BY A FRESHLY ASSEMBLED 454 CUBIC INCH BIG BLOCK CHEVY. THE INTERIOR HAD JUST BEEN REDONE. IT LOOKED GREAT AND COMPLIMENTED THE BOAT VERY WELL. IT'S EVEN COMFORTABLE. WE KNOW BECAUSE WE TOOK IT FOR A LITTLE FLOAT. THE ENGINE RAN GOOD AND THE BIG OLE ROOSTER TAIL REASSURED US THIS WAS GOING TO BE A COOL PROJECT. (MIKE)>> THE ENGINE STILL NEEDS A FEW THINGS PUT ON IT BEFORE WE SET IT IN THE BOAT. NOW SOME OF THOSE PARTS WILL BE ORIGINAL AND SOME WILL BE NEW. WE'LL START BY INSTALLING THE FLEX PLATE. (PAT)>> AND THAT SHINNY NEW FLEX PLATE IS A SUMMIT RACING PIECE. THIS PARTICULAR ONE HAS AN SFI 29.1 RATING. IT'S 168 TOOTH, AND IS SETUP FOR A TWO PIECE REAR MAIN SEAL BLOCK. IT IS ALSO SETUP FOR INTERNALLY BALANCED ENGINES, WHICH THAT'S WHAT OUR 540 IS. ARP BOLTS WILL SECURELY FASTEN IT TO THE CRANK SHAFT, AND FOR A LITTLE EXTRA INSURANCE WE'RE ADDING SOME PERMATEX MEDIUM STRENGTH THREAD LOCKER BLUE. FINALLY THE FASTENERS ARE TORQUED TO 85 POUND FEET. (MIKE)>> PAT AND I NOTICED THAT THE DRIVE COUPLER THAT GOES FROM THE CRANK SHAFT FLANGE TO THE INLET OF THE PUMP HAS A SLIGHT ISSUE. NOW THIS UJOINT MOVES NICE AND FREE WITHOUT ANY BINDING, HOWEVER THIS ONE IS VERY HARD TO MOVE AND BINDS PRETTY MUCH EVERYWHERE. SO WE'RE GONNA CHANGE IT OUT FOR A NEW ONE FROM MOOG. THE FIRST THING TO DO IS REMOVE THE RETAINING CLIPS THAT FIT IN THE GROOVE OF THE HOUSING. THEY ARE WHAT HOLD THE CAPS IN PLACE. HERE'S A LITTLE TIP. DEPENDING ON YOUR SETUP, THE CLIP MAY BE ON THE INSIDE OF THE CUP. NOW IF YOU DON'T SEE ANY ON THE FRONT OR BACK, CHANCES ARE THE MANUFACTURER INJECTED PLASTIC INTO THE GROOVES VIA A SMALL HOLE, AND THEY HAVE TO BE HEATED TO BE REMOVED. I'M NOT GOING TO USE A HAMMER AND BEAT THE UJOINTS OUT. ALL THAT DOES IS WARP THE YOKE. THE CORRECT WAY TO REMOVE AND INSTALL THEM IS WITH A PRESS. A COUPLE OF HARDENED SOCKETS WILL BE USED TO PRESS THE CUPS OUT. THIS MAKES IT VERY EASY. WITH THE OLD ONE OUT, A NEW CUP IS PUT IN PLACE AND THE JOINT IS SLID INTO THE CUP. NOW I'LL PRESS THIS CUP IN UNTIL IT'S FLUSH WITH THE YOKE. THE OTHER CUP IS POSITIONED AND PRESSED IN JUST ENOUGH TO CLEAR THE RETAINING CLIP GROOVE. NOW A CLIP IS PUT IN THAT GROOVE. BACK ON THE OTHER SIDE THE CUP IS PRESSED TO CLEAR THE GROOVE AS WELL, AND A CLIP IS INSERTED. MAKE SURE IT'S FULLY SEATED. THE SAME PROCEDURE IS USED FOR THE OTHER TWO THAT HOLD THE SPLINED PORTION OF THE YOKE TO THE COUPLER. THE ASSEMBLY SHOULD MOVE FREELY WITHOUT ANY TIGHT SPOTS. SINCE IT'S A MARINE APPLICATION, A QUICK COAT OF DUPLICOLOR ENAMEL WILL HELP RESIST RUST, AND IT DRIES FAST. NOW THE FRONT ENGINE PLATE CAN GO ON. THIS IS AN ORIGINAL EDELBROCK PART THAT I CANNOT FIND ANY INFORMATION ON. IT HAS BEEN REPAIRED AS WELL. IF ONLY IT COULD TALK? NOW THE BELL HOUSING CAN BE SET IN PLACE OVER THE PUMP HOUSING, AND IT'S TIME TO HANG THIS 540 INCH BIG BLOCK USING OUR PIT PAL ENGINE SLING WE GOT FROM SUMMIT RACING. THE 22 INCH LONG STRAPS MAKE IT EASY TO PULL OR INSTALL ANY ENGINE, EVEN IF IT HAS A BLOWER OR A TUNNEL RAM. 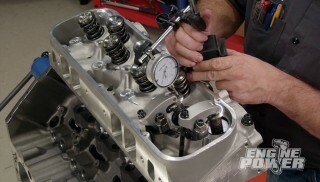 IT SUPPORTS 1,000 POUNDS AND ATTACHES TO EITHER THE HEADER BOLT HOLES OR THE FRONT AND BACK OF THE CYLINDER HEADS. SINCE THE BOAT DOES NOT USE THEM, THE CONVENTIONAL MOUNTS CAN GO BACK IN THE DYNO ROOM. AFTER A COUPLE OF MINUTES OF TRYING TO GET THE SPLINE COUPLER STARTED ON THE PUMP SHAFT WE REALIZED THE OIL PAN WAS HITTING THE HULL OF THE BOAT. SO A CHANGE WAS NEEDED. A QUICK CALL TO SUMMIT RACING HAD THIS MILODON PAN HERE IN A COUPLE OF DAYS. IT'S A 10 QUART MARINE PAN WITH A SEVEN AND A HALF INCH DEPTH, BUILT IN BAFFLING, AND A WINDAGE TRAY. NOW ONTO ROUND TWO. (ROB)>> LET ME KNOW WHEN I'M CENTERED UP. (MIKE)>> UM YOU'RE PRETTY GOOD RIGHT THERE, YEAH. ALL RIGHT NOW BRING IT BACK TO ME. ALL RIGHT! THE OBJECT IS TO GET THE COUPLER STARTED ON THE PUMP SHAFT FIRST. THEN EVERYTHING ELSE PRETTY MUCH FALLS INTO PLACE. (NARRATOR)>> UP NEXT, THIS LX RACER WAS ONE OF OUR FAVORITE PROJECTS. AFTER SOME UPGRADES IT'S BACK ON THE ROLLER READY TO MAKE MORE POWER. (MIKE)>> WE'RE BACK AND CHANGING DIRECTION FROM THE BOAT TO THIS GORGEOUS LX MUSTANG, AND I HAVE QUITE A BIT OF HISTORY WITH THIS CAR. ABOUT FIVE YEARS AGO THE OWNER, JEFF WHITAKER, AND I WERE TASKED TO BUILD A COYOTE STOCK CAR PER THE RULES FOR THE NMRA SERIES, AND WE ONLY HAD A WEEK AND A HALF TO DO IT. NOW HERE'S A QUICK LOOK AT HOW THIS CAR CAME ABOUT. WE GOT BUSY BY REMOVING THE FRONT KMEMBER WITH THE ENGINE AND TRANS STILL ATTACHED. THE CAR WAS RAISED AND IT WAS ROLLED OUT IN ONE PIECE. THE REAR END WAS PULLED AND THE GAS TANK WENT AWAY AS WELL. THE NEW KMEMBER, SEALED COYOTE, AND THE CFOUR AUTO WENT INTO PLACE UNDER THE CAR. OUT BACK A NEW NINE INCH REAR WAS INSTALLED USING NEW CONTROL ARMS. A LOT OF OTHER PARTS WERE INSTALLED IT TO GET US HERE. WHEN IT WAS ALL FINISHED UP WE STRAPPED TO THE ROLLERS AND MADE SOME RUNS. 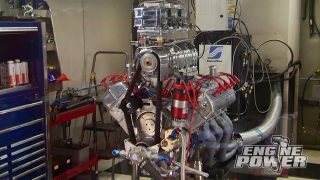 WITH THE FORD TUNE IT LAID DOWN 367 HORSEPOWER AND 310 POUND FEET OF TORQUE. ALL THAT WORK GAVE JEFF'S CAR A DIVERSE PLATFORM TO DO MORE THAN JUST COYOTE STOCK RACING. NOW JEFF IS WELL KNOWN IN THE BRACKET WORLD FOR CHOPPING THE TREE DOWN ON HIS COMPETITORS AND WINNING RACES, BUT RECENTLY HE HAD THE ITCH TO GET BACK INTO HEADS UP RACING. SO THE CAR FOUND ITS WAY TO JASON BROWN AT THE MOD SHOP IN FLORENCE, ALABAMA. NOW JEFF TELL ME ALL ABOUT THE NEW CLASS AND WHAT YOU HAVE PLANNED. (JEFF)>> WE'RE JUST GONNA TRY TO HIT THE FACTORY STOCK THING A LITTLE HARDER THAN WE DID THE COYOTE STOCK. WE TRIED THE COYOTE STOCK FOR AROUND A YEAR OR SO AND WE REALLY DIDN'T HAVE ENOUGH TIME OR THE EXPERIENCE I GUESS TO COMPETE LIKE WE WANTED TO COMPETE. I KIND OF MADE A DECISION THROUGH MY BUDDY JASON BROWN. 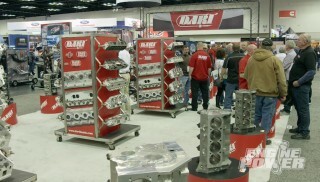 WE GOT TO TALKING, AND KINDA WANT TO GO BACK TO FACTORY STOCK RACING. 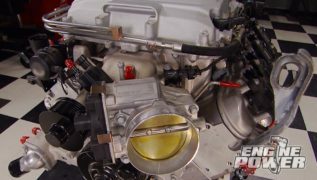 (MIKE)>> NOW WHAT ARE SOME OF THE BIG DIFFERENCES BETWEEN COYOTE STOCK AND FACTORY STOCK RULES? 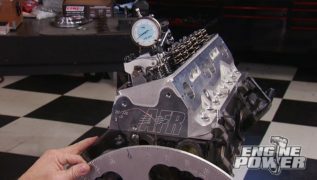 (JEFF)>> THE BIGGEST DIFFERENCE I GUESS IS YOU CAN USE A VARIETY OF ENGINES EXCEPT JUST A SEALED COYOTE. YOU'VE GOT THE COYOTE PLATFORM, YOU'VE GOT THE FOURSIX PLATFORM, YOU'VE GOT THE OLD 302 PUSH ROD PLATFORM. THAT'S THE BIGGEST THING. YOU CAN DO A LITTLE WORK ON THE MOTOR, NOT MUCH WITH COYOTE STOCK. YOU COULDN'T DO ANYTHING WITH THEM. YOU'VE GOT A SEALED MOTOR THAT YOU REALLY CAN'T TOUCH. (MIKE)>> WHAT IS ONE OF THE BIGGEST COMPONENTS IN YOUR EYES WHEN IT COMES TO REALLY DIALING THE CAR IN, FINDING THAT MILE AN HOUR, AND GETTING IT DOWN THE TRACK THE WAY IT NEEDS TO GO? 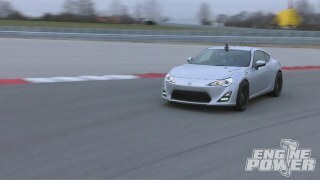 (JEFF)>> FOR ME DEFINITELY IT'S GONNA BE THE TORQUE CONVERTER. PTC, THE TORQUE CONVERTER THEY BUILT IS, I THINK THAT'S GONNA BE OUR HOLE IN ONE. (MIKE)>> NOW I KNOW JASON AND PAT HAVE BEEN TALKING OVER IN THE CORNER ABOUT THE UPDATES AND THAT THAT HAPPENED AT HIS SHOP. SO I GUESS WE'LL TURN IT OVER TO THEM AND THEY CAN FILL EVERYBODY IN. (JEFF)>> SOUNDS GOOD TO ME! (PAT)>> I'M HERE WITH JASON BROWN FROM THE MOD SHOP, WHO IS THE ACTUAL OWNER, AND THEY DO EVERYTHING FROM REGULAR STREET CARS TO FULL BORE PRO MODS AND EVERYTHING IN BETWEEN, BUT LET'S TALK ABOUT JEFF'S CAR HERE. THIS WAS A FULLY FUNCTIONAL RACE CAR WHEN YOU GOT IT. SO YOU WANTED TO DO A FEW THINGS THAT WERE SPECIFIC FOR THE CLASS YOU WANT TO RUN. SO TELL ME A LITTLE BIT ABOUT THEM. (JASON)>> THE CAR WAS CLASS LEGAL AT THE TIME, AND WE DECIDED WE WANT TO UPGRADE SOME SAFETY ISSUES ON IT. IT HAD A SIX POINT ROLL CAGE IN IT. SO WE ADDED APILLAR BARS, AND THE DASH BAR, AND WINDSHIELD BAR. WE PUT A NINE INCH MOSSIER CENTER SECTION IN THE REAR AXLE ASSEMBLY, AND WE HAD THE GEARS LIGHTENED, PRO LIGHTENED, AND ALSO TO REDUCE A LOT OF FRICTION WE HAD THEM POLISH THE GEAR SET. TOOK THE ENGINE OUT AND THE ENGINE HAS SOME PISTON OILERS, AND TO FREE UP A LITTLE HORSEPOWER FROM WINDAGE OF THE OIL WE BLOCKED THOSE OFF WITH MMR BLOCK OFF PLATES. 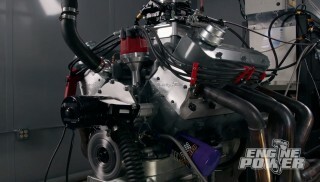 (PAT)>> I'M VERY INTERESTED TO SEE WHAT IT DOES ON THE CHASSIS DYNO, BUT THE CHASSIS DYNO, AGAIN, IT'S LIKE A TOOL. THE REAL DATA AND THE REAL COMPARISON, THE REAL TUNING, A LOT OF IT HAS TO HAPPEN AT THE RACE TRACK. (JASON)>> IT WILL, AND IT DOES. WE CAN USE THIS AS A BASELINE TO SEE IF WE'RE GOING IN THE RIGHT DIRECTION, AND THEN WE'LL TAKE IT AT THE TRACK FROM THERE. (PAT)>> WELCOME BACK TO ENGINE POWER. JEFF WHITAKER'S FACTORY STOCK COYOTE POWERED LX MUSTANG IS GETTING HOOKED UP TO THE DYNOJET TO MAKE SOME POWER PULLS. (MIKE)>> ALL RIGHT, THE FIRST PULL WE'RE GONNA MAKE IS BASICALLY OUR BASELINE. WE'LL BE USING THE TUNE THAT CAME STOCK IN THE ECM FROM FORD, WHICH IS BASICALLY THE SEALED ENGINE COYOTE STOCK SETUP. NOW AFTER THAT WE'RE GONNA USE AN SCT PROGRAMMER AND JASON'S EXPERIENCE TO STEP UP THE NUMBERS. GO AHEAD AND FIRE IT. (PAT)>> LISTEN TO THAT COYOTE SCREAM. MAN THAT'S GOOD FOR A FIRST RIP. SOUNDS AWESOME! (PAT)>> I THINK YOU CAN TUNE A LITTLE MORE INTO IT. (JASON)>> OH YEAH, I THINK WE CAN ADD A DEGREE OR TWO OF TIMING AND SEE WHAT WE CAN COME UP WITH. (MIKE)>> 400 ON THE MONEY, ON THE NOSE! YES, YES, YES, THAT DID IT! ALL RIGHT, NAILED IT! ALL RIGHT GUYS, IT LOOKS LIKE WE OPENED AND SHUT ANOTHER CHAPTER ON THIS BEAUTIFUL CAR. JEFF HOW DO YOU THINK TODAY WENT? (JEFF)>> I THINK IT WENT GREAT. I THINK WE GOT A LITTLE BIT LEFT ON THE TABLE LIKE WE DISCUSSED, BUT BETWEEN OUR JLT INTAKE, OUR JMS TUNES, OUR PTC CONVERTER, MAN I THINK WE'VE GOT SOME LEFT. I'M EXCITED! (MIKE)>> GOOD DEAL, JASON ONE THING FOR YOU. STRATEGY OUT AT THE TRACK, WHAT ARE SOME OF THE THINGS YOU'RE GONNA GO AFTER FIRST? (JASON)>> JUST SOME DATA LOGGING AND MAKE SURE OUR TUNE UP'S CORRECT FOR THE TRACK, AND JUST THE CONTINUED SUPPORT AND HELP FROM THE GUYS AT PTC, KENNY, AND JMS, AND YOU GUYS. WE COULDN'T ASK FOR ANY BETTER. I MEAN THANKS FOR THE ENTIRE TIME. I MEAN IT'S BEEN GREAT. 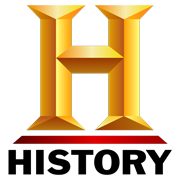 (MIKE)>> WELL WE APPRECIATE IT AND THE DAY WHEN YOU GUYS FIND OUT WHERE THE FIRST RACE IS YOU LET US KNOW CAUSE WE'LL BE THERE. 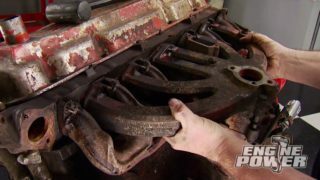 (NARRATOR)>> SOMEONE TURNED OUR MOPAR BIG BLOCK INTO A PARTS DONOR. SO WE'RE REBUILDING IT STRONGER THAN EVER. (PAT)>> FROM A CHEVY TO A FORD, AND NOW A MOPAR. WE BUILT THIS 512 CUBIC INCH BIG BLOCK STROKER LAST YEAR TO SHOW ALL OF YOU MOPAR FANS THAT OFF THE SHELF PARTS CAN MAKE SOME GREAT POWER. 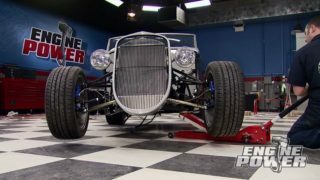 THIS SWEET RUNNING BULLET WAS ON 93 OCTANE PUMP GAS AND CRANKED OUT 632 HORSEPOWER AND 647 POUND FEET OF TORQUE. WITH ITS BROAD TORQUE CURVE AND GREAT POWER BAND IT WILL WORK AWESOME IN ANY HOT ROD OR DIRT SLINGER. IT SAT IN THE HALLWAY AND UNFORTUNATELY IT HAD SOME PARTS SCAVENGED OFF IT BY MARC AND TOMMY DOWN AT DETROIT MUSCLE. THEY NEED THE ROCKER ARMS AND PUSH RODS FOR A PROJECT OF THEIR OWN, BUT LUCKILY THIS ENGINE HAS A NEW LEASE ON LIFE. IT'S GONNA POWER A BRAND NEW PROJECT THAT'S HERE IN THE BUILDING, AND WE'RE GONNA DO SOME UPDATES TO IT BECAUSE THAT PROJECT REQUIRES A LITTLE MORE POWER. THE ENGINE WILL BE PULLED DOWN TO A BASIC SHORT BLOCK. ONLY THE ROTATING ASSEMBLY WILL REMAIN. AS THE VALVE COVERS ARE REMOVED YOU'LL SEE WHAT'S MISSING. THE ROCKERS, SHAFTS, AND PUSH RODS ARE CONSPICUOUSLY ABSENT. THE INTAKE WAS REMOVED ALREADY. 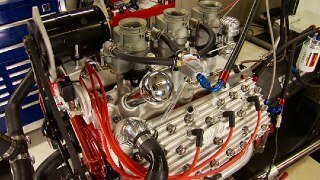 IT'S A TRICK FLOW TRACK HEAT WITH AN OPERATING RANGE FROM 3,000 TO 7,000 RPM, AND ACCEPTS A 41-50 CARBURETOR. ARP HEAD STUDS SECURED THESE TRICK FLOW POWER PORT 240cc HEADS TO THE BLOCK. THEY ARE EQUIPPED WITH TWO-190 INTAKE VALVES AND ONE-760 EXHAUST VALVES. THE COMBUSTION CHAMBERS ARE 78cc, AND THEY FLOW 326 CFM AT 600 LIFT ON THE INTAKE AND 253 CFM ON THE EXHAUST. THEY WILL NOT BE REUSED. THE LIFTERS ARE TIE BAR STYLE HYDRAULIC ROLLER. THEY'RE GOING BYE BYE AS WELL. THIS MAZIERE ELECTRIC WATER PUMP WILL GO BACK ON FOR THE DYNO RUNS. NOW THE BALANCER CAN BE REMOVED ALONG WITH THE TIMING COVER. THIS DOUBLE ROW TIMING SET WILL BE REUSED WHEN IT GOES BACK TOGETHER. FINALLY THE CAM COMES OUT. DURATION AT 50 THOUSANDTHS ON THE INTAKE IS 252 DEGREES, 262 DEGREES ON THE EXHAUST. THE LOBE SEPARATION ANGLE IS 112 DEGREES. LIFT WITH ONESIX ROCKERS IS 640 FOR THE INTAKE AND 672 FOR THE EXHAUST. A MAJOR CHANGE FOR THIS ENGINE WILL BE THE CYLINDER HEAD. ANY TIME YOU INCREASE AIR FLOW THE ENGINE HAS THE POTENTIAL TO PRODUCE MORE POWER. SO WHY WOULD WE PULL OFF A PERFECTLY GOOD SET OF TRICK FLOW POWER PORT 240 HEADS? WELL THEY RECENTLY CAME UP WITH SOMETHING A LITTLE BIGGER AND A LITTLE BETTER. THIS IS THEIR POWER PORT 270. NOW THE 270 REFERS TO THE INTAKE RUNNER SIZE, WHICH IS 270cc. THEY STILL HAVE THE SAME 78cc COMBUSTION CHAMBER AND THE VALVE SIZES ARE STILL THE SAME AT TWO-190 ON THE INTAKE, ONE-760 ON THE EXHAUST, BUT WHERE THESE HEADS DIFFER ARE THEIR FLOW NUMBERS. TAKE A LOOK FOR YOURSELF. THE 270 PORT OUT FLOWS THE 240 EVERYWHERE ABOVE 400 THOUSANDTHS LIFT. THE GAINS ARE IMPRESSIVE TO SAY THE LEAST. 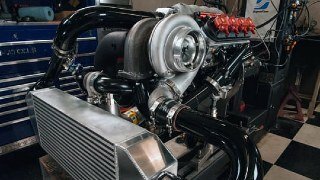 THIS WILL REALLY BENEFIT BIGGER ENGINES THAT MAKE MORE POWER AT HIGHER RPM. 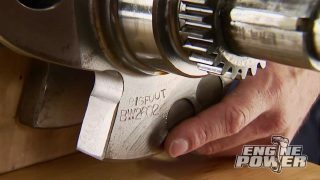 THE NEXT TIME YOU SEE US WORK ON THIS BULLET WE'RE GONNA SHOW YOU MORE UPGRADES, WHICH INCLUDES A LARGER AND MORE AGGRESSIVE CAM SHAFT, AND FOR MORE INFORMATION ON TODAY'S SHOW OR ANY OF THE ITEMS WE USED LOG ON TO POWERNATION TV DOT COM. IN TODAY'S POWERNATION EXTRA WE'RE GONNA GO OVER SOME MORE PARTS VERIFICATION, BUT THIS FALLS UNDER A BROADER SUBJECT OF ENGINE BLUEPRINTING. 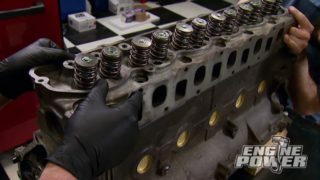 NOW IF YOU'RE A HOT RODDER OR A CAR GUY YOU'VE HEARD THE TERM ENGINE BLUEPRINTING QUITE A BIT, AND SIMPLY WHAT THAT MEANS IS YOU ARE SETTING CLEARANCES AND TOLERANCE TO WHAT YOU FEEL ARE CORRECT FOR YOUR PARTICULAR APPLICATION, WHETHER IT'S A STREET CAR OR A FULL TILT RACE BULLET, AND TODAY WE'RE GONNA GO OVER SOMETHING PRETTY SPECIFIC ON THE END OF THE CAM SHAFT. 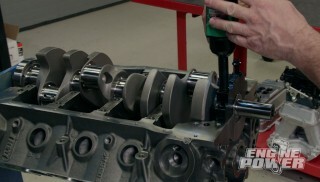 ALTHOUGH IT MAY NOT SEEM LIKE IT, THE END OF THE CAM SHAFT IS EXTREMELY IMPORTANT. THIS IS WHERE THE TIMING GEAR IS BOLTED, AND IF THIS SURFACE IS NOT PERPENDICULAR WITH THE GROUND JOURNAL IT CAN CAUSE ALL TYPES OF PROBLEMS BECAUSE THE TOP GEAR WON'T RUN TRUE. HERE ARE THREE PROBLEMS THAT CAN ARISE FROM THE TIMING GEAR NOT RUNNING TRUE. FIRST, IT WILL CAUSE EXCESSIVE WEAR ON THE CHAIN AND GEAR. AS THESE PARTS WEAR OUT THEY CAN DEPOSIT METAL DEBRIS INTO THE OILING SYSTEM, OR WORSE THE TOP GEAR WILL FAIL, LEADING TO CATASTROPHIC ENGINE DAMAGE. SECOND, ON FLAT TAPPET APPLICATIONS THE EXCESSIVE BACK AND FORTH MOVEMENT OF THE CAM CAN CAUSE INCREASED WEAR ON LOBES AND LIFTERS, AND THIRD, IN EXTREME CASES IT CAN CAUSE IGNITION TIMING FLUCTUATIONS AND INCREASE WEAR ON THE DISTRIBUTOR GEAR ITSELF. ARMED WITH THIS NEW INFORMATION HOW WOULD YOU GO ABOUT CHECKING THIS? WELL ALL YOU NEED IS A MAGNETIC BASE DIAL INDICATOR, WHICH IS AN ESSENTIAL TOOL FOR ENGINE BLUEPRINTING AND WE'RE GONNA DO IT IN THE MOCK UP STAGE WITH NO CHAIN OR BOTTOM GEAR INSTALLED. SO IF WE HAVE TO MAKE A CHANGE TO THE FRONT OF THE CAM SHAFT IT'S EASY TO PULL OUT. WE'LL ATTACH THE MAGNETIC BASE TO THE BLOCK AND ZERO OUT OUR GAUGE. TO TURN IT I'LL USE A SPEED HANDLE SO I CAN KEEP MY HANDS OUT OF THE WAY. BY ROTATING THE CAM SLOWLY THE GAUGE WILL INDICATE THE AMOUNT OF RUNOUT AT THE TIMING GEAR. WE HAVE LESS THAN TWO THOUSANDTHS TIR, OR TOTAL INDICATED RUNOUT. THAT IS AN ACCEPTABLE TOLERANCE TO HAVE BUT IT IS ON THE HIGH SIDE. ANYTHING MORE THAN THAT YOU'RE GONNA START EXPERIENCING SOME OF THE PROBLEMS THAT WE DISCUSSED EARLIER AND HERE'S WHERE YOU HAVE TO GET A MACHINE SHOP INVOLVED BECAUSE MOST PEOPLE CAN'T DO THIS THEMSELVES BUT WE'RE GONNA SHOW YOU HOW IT'S DONE. OVER HERE IN THE LATHE I CHUCKED UP AN OLD CAM OUT OF ANOTHER ENGINE THAT HAD AN EXTREME AMOUNT OF RUNOUT, OVER 20 THOUSANDTHS AT THE GEAR, AND IT'S VERY EASY TO SEE. WE'RE JUST GONNA TAKE OFF THE MINIMUM AMOUNT SO WE GET 100 PERCENT CLEAN UP ON THE CAM. ONCE FINISHED THE CAM GEAR WILL RUN STRAIGHT AND TRUE, PROBLEM SOLVED!